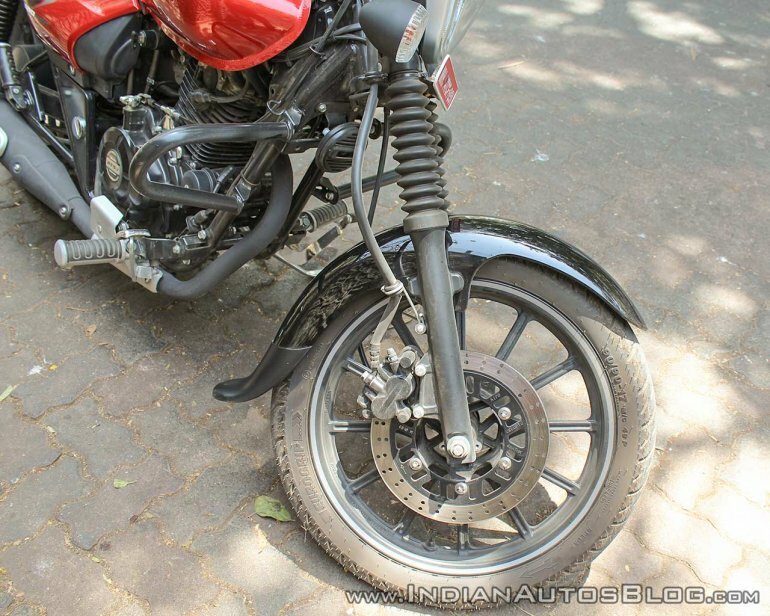 Bajaj Auto has retained the characteristic Avenger design in the 180 as well. Since the bike is a ‘Street’ version, it gets a sleek headlight with a black-tinted flyscreen. There are LED DRLs just under the headlight. Since the LEDs are always on, the main headlight bulb has an on/off switch. This setup helps in conserving the battery. The 55/60 W, H4 (with blue tinge) headlight’s intensity and throw are also good enough for riding in low light. The wide tank flows into the sculpted single-piece seat. The seat is quite low and easily reachable. The footpegs are forward biased, but the shorter Street Control handlebar give it a laid-back yet slightly sporty riding stance. The seat offers good comfort, especially to the lower back, which aids in long-distance riding. 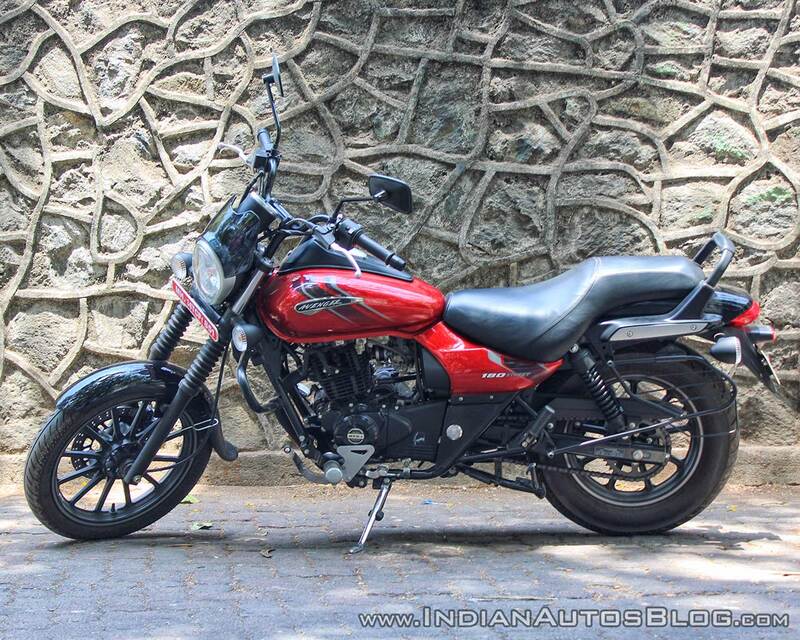 It is 730 mm high, 10 mm less than its competitor, the Suzuki Intruder 150. The instrumentation however, is barebones. There’s an analogue speedometer, and the digital inset shows a single trip meter and odometer readings. The switchgear is built to a price, and is same as the one in the 2018 Discover 110. Wish Bajaj had used the Pulsar’s switchgear for a more premium quotient. On the fuel tank is the fuel gauge, tell-tale lights for the indicator, high-beam, neutral and battery light. The instrumentation’s backlight remains off if the headlight switch is off. This could be an inconvenience when riding through low-light areas, as one will have to manually switch the headlight on to see his/her instrument cluster clearly. Though the tank-mounted cluster looks cool, it is below the rider’s line of sight while riding. The pillion seat comes with a sporty backrest which doubles up as a grab-rail. The ignition is near the engine on the right, and the handlebar lock is in the steering stem, like the earlier bike. 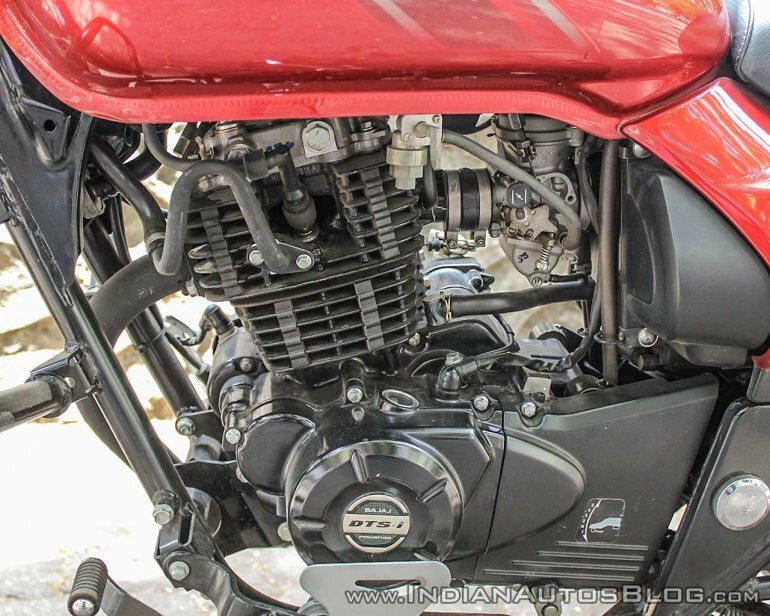 Bajaj has reworked the Pulsar 180’s engine in a way that it is mellow enough for long highway rides. 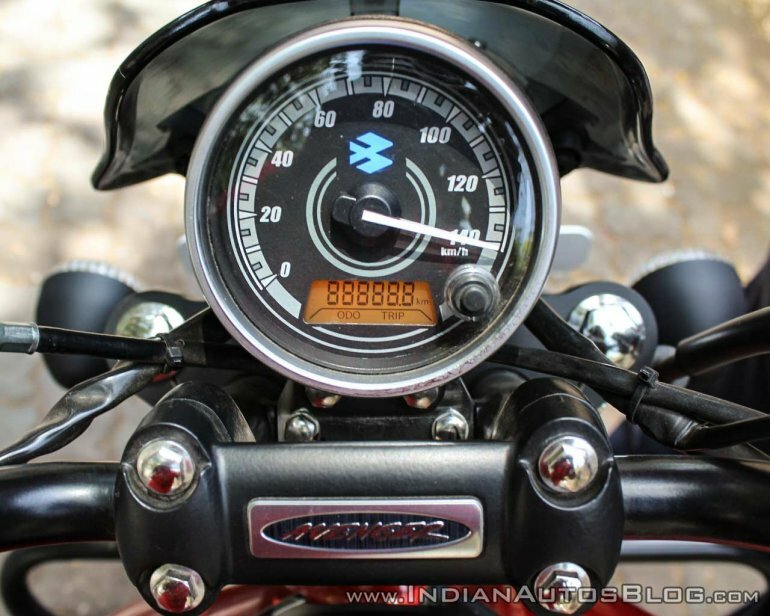 The engine is at its sweet spot at 70 kmph, post which the buzz creeps onto the pegs. It gets more pronounced as the speed goes beyond 90 kmph. The engine is powerful enough to sustain triple digit speeds, but the vibration puts off the rider from pushing the bike. The 180 cc 2-valve twin spark engine with air cooling makes 15.5 PS at 8,500 rpm. 13.7 Nm of pull comes in at 6,500 rpm. The 5-speed transmission is slick but isn’t always precise as I experienced false neutral at times. The first gear is a tad short but the fifth gear is versatile enough from 35 kmph all the way to its top speed. I was able to touch a maximum speed of 125 kmph. The fuel tank can hold 13 litres of juice, including a generous 3.8 litres of reserve. The bike returned 32.6 km/l under a combination of pedal-to-the-metal highway riding and pottering around in city traffic. The efficiency could easily go beyond 40 km/l if ridden with a sensitive wrist. The Bajaj Avenger 180 Street’s diamond type frame rides on telescopic front fork with gaiters and twin rear shock absorbers. The dampers effortlessly make short work of bad roads. The suspension setup is nicely tuned for Indian roads, and even on high speeds, the bike feels surefooted. This could partly be attributed to its generous 1,480 mm wheelbase. This is in fact 130 mm more than the reasonably-big Royal Enfield Thunderbird 350 and such long wheelbase is both a boon and a bane. While it aids in high-speed stability, it becomes tedious to make tight turns in traffic. 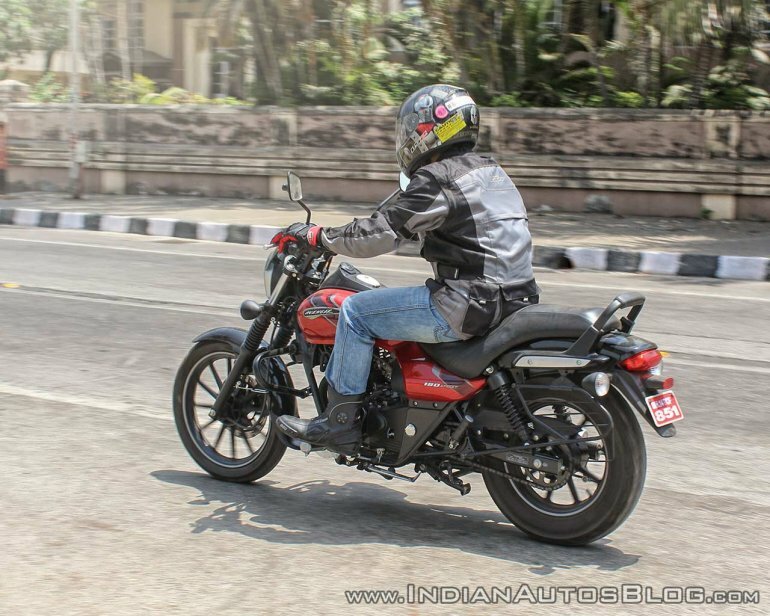 The short handlebar enhances the manoeuvrability to an extent, though. Pull the front brake lever and you could feel the two-piston callipers biting hard to restrain this swanky cruiser. The way the front (260 mm disc) and rear brakes work together to bring the bike to a grinding halt is simply brilliant. The 130 mm drum could do with a little more feel. The 17-inch front and 15-inch rear alloy wheels are shod with 90/90 - 49P and 130/90 - 66P MRF Nylogrip Zapper tubeless tyres respectively. The grip is commendable for both relaxed and spirited riding. Unfortunately, there is no ABS, even as an option as Bajaj launched the bike in February, before the ABS and CBS implementation in April. The Avenger 180 is available only in Street format. 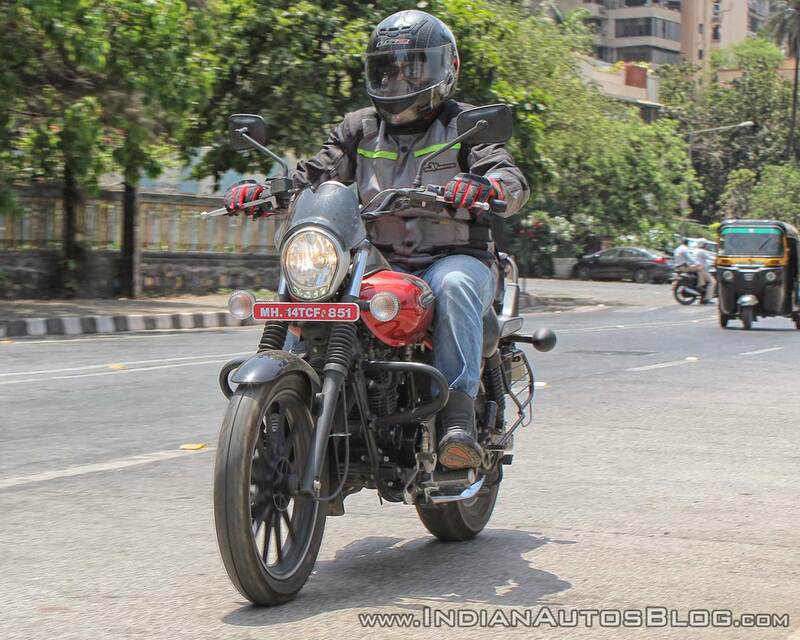 With the new bike, Bajaj has aimed to offer aspiring Avenger buyers something that has a bit more grunt than a 150, especially for the occasional weekend rides. 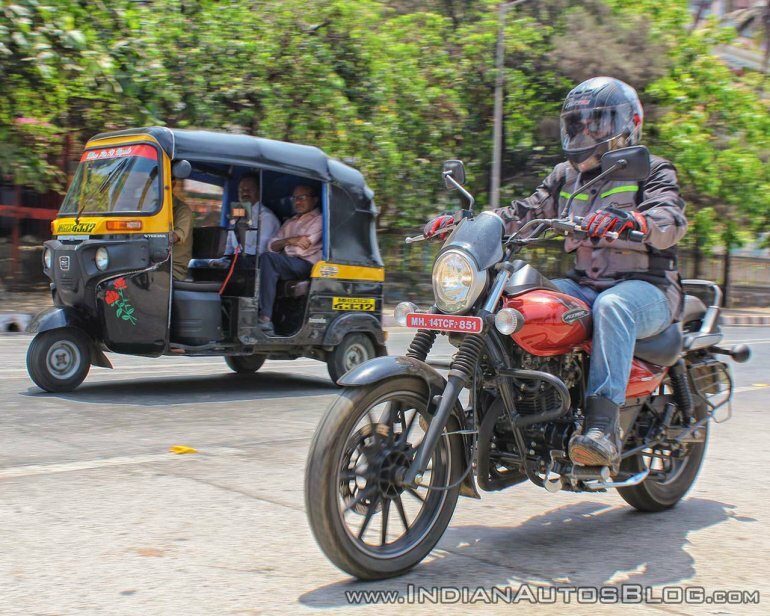 I would say Bajaj has really achieved what it intended to do. Sure, the vibrations are a bit annoying, but the sprightly engine performance, sorted suspension and strong brakes make it a very capable machine. 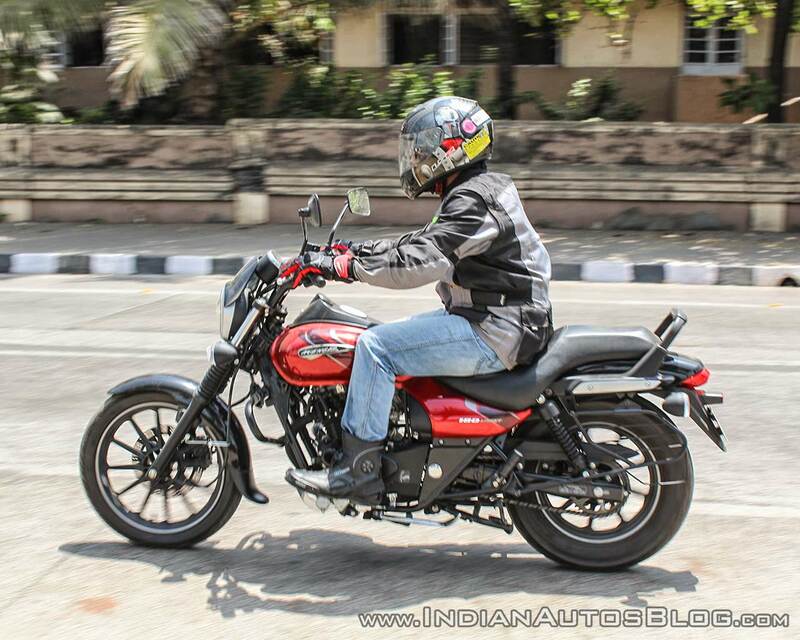 Moreover, the swanky Harley-Davidson Street 750-like looks never failed to impress its target audience. Interestingly, though the Avenger 180’s cousin, the Pulsar 180 is cheaper (by INR 2,848), it is more powerful; and gets better features as well. At an ex-showroom, Delhi price of INR 85,498, the Bajaj Avenger 180 Street is INR 3,000 more expensive than the Avenger 150. For that small premium, you get a bigger engine and also slight styling upgrade, thus becoming a brilliant value-for-money product. Its only rival in the segment, the Suzuki Intruder 150 is INR 14,497 more expensive, while offering a different design. The Bajaj Avenger 180 Street will appeal to those who want a laid-back cruiser that can tackle city roads, and is ready for highway jaunts as well.